Life has been quite busy lately juggling 3 kiddos, including a newborn and slowly picking up work projects again. I’m learning all kinds of news ways to multitask! Currently getting a pedicure (yay!) and writing a blog post that I’ve been meaning to share for awhile (another yay!). This also means that today I’m pulling photos for this post that I already have on my computer…. which happen to be of my girls in our living room. Looking adorable ;). 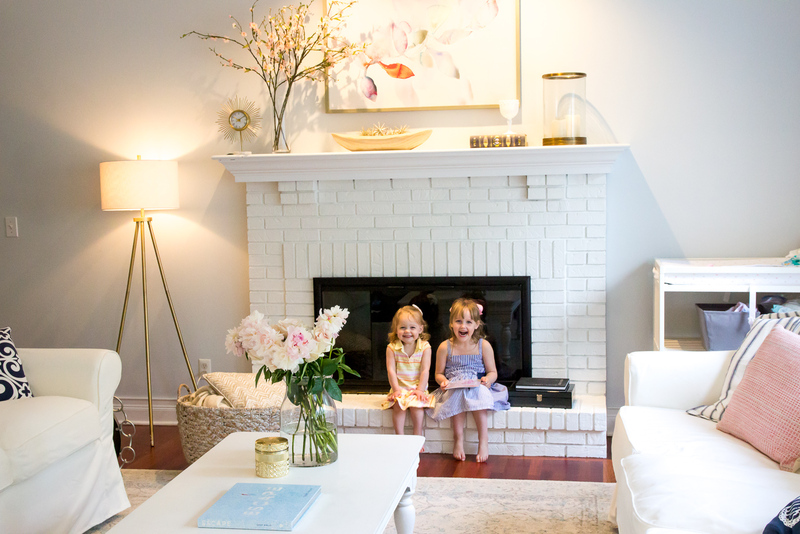 The photos were taken at dusk so you’ll be able to see even without much natural light, brightening up a fireplace makes a big difference overall. 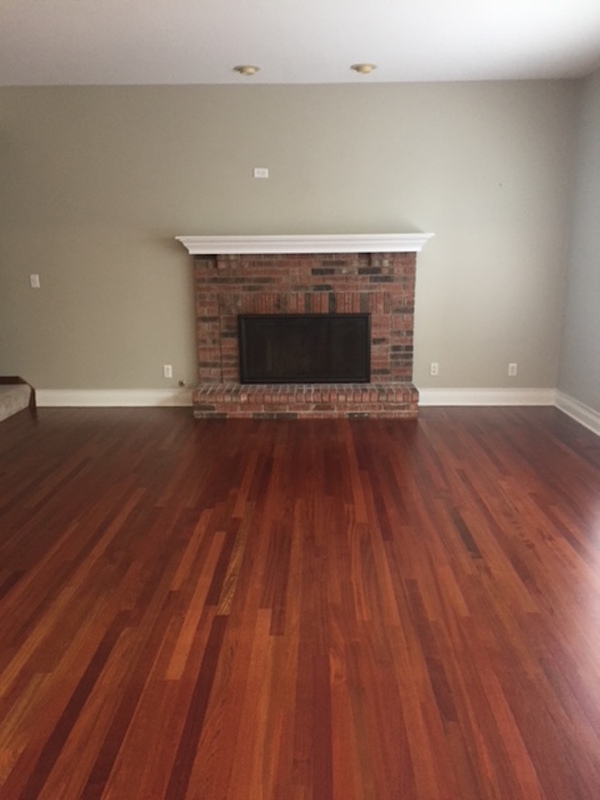 If you want to make an easy change to a room, start with the fireplace since it is almost always the focal point in a space. The first project I’m sharing is our living room and the second is from a client’s house. I love how BOTH turned out and it is hard to go wrong with either choice. 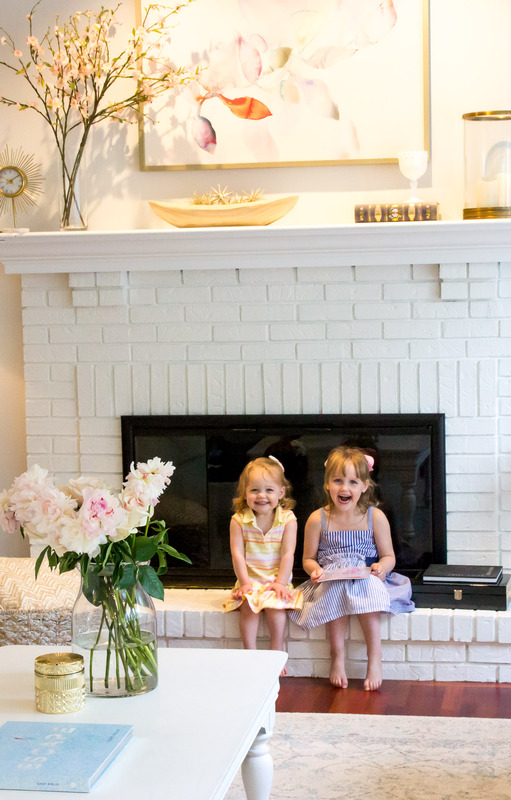 In our house, we painted our fireplace a bright white, Chantilly Lace. It’s been my go-to white for awhile now since it is a true, crisp white. I highly recommend trying out any white paint in large samples because the undertones may shock you. So far, Chantilly Lace has not disappointed and I’ve used it in a variety of spaces (light filled rooms and dark, trim, furniture projects, cabinets, you get the idea). 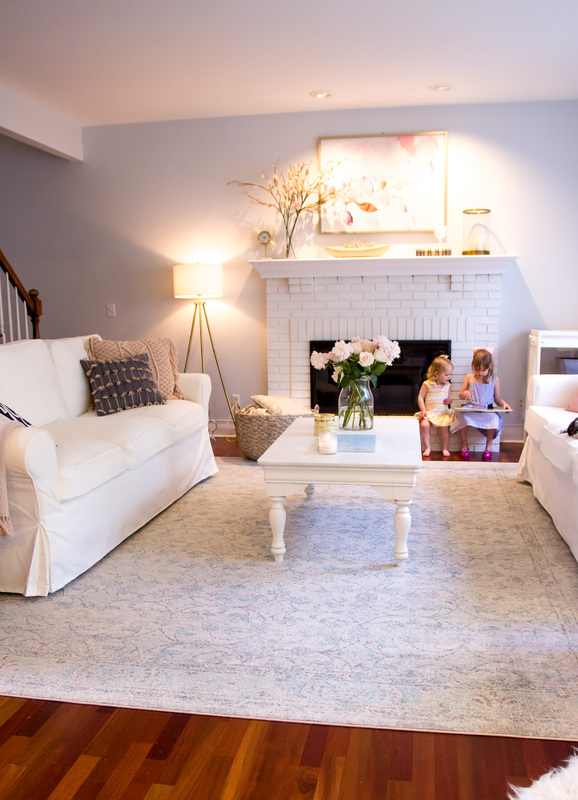 You can see more photos of our living room here during the day in this post (and without that *stylish* changing table next to the fireplace that i tried to crop out!). You’ll also see from this post we have a lot of white pieces in our home which I know most people are hesitant about if they have kids. 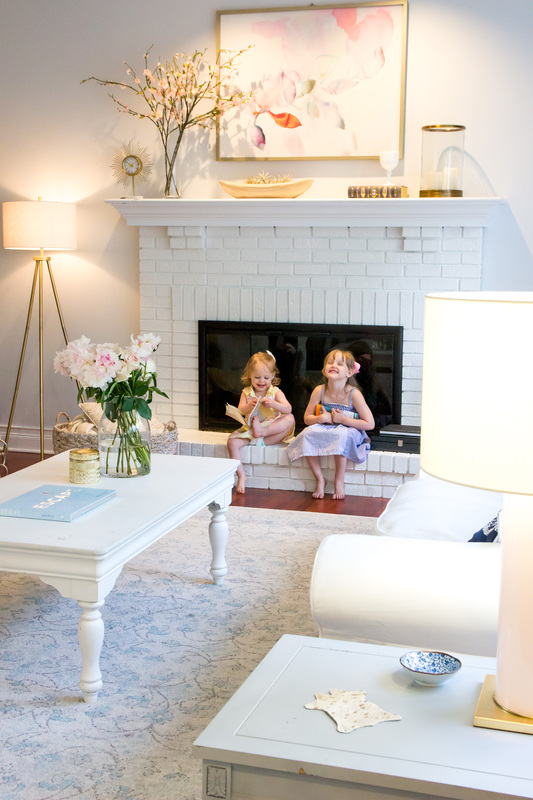 One of the best things about painting a fireplace is that it’ll brighten up a room and you don’t have to worry about it getting dirty or stained. PS. you can read all about why our white sofas were a great decision for us in this post! The second idea to brighten up a fireplace (which I’ve had so many messages about!) is one of my favorite things to do — WHITEWASHING. 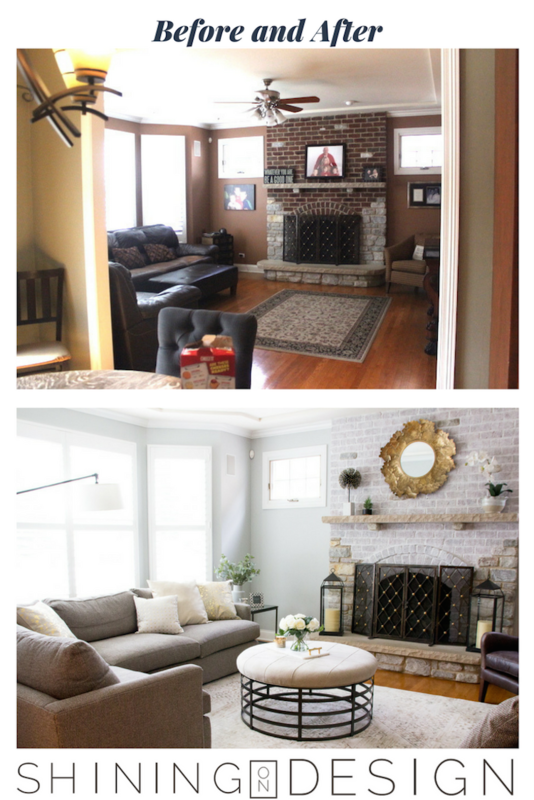 You can see more of their family room before and after photos in this blog post too. We’re also working on their master bath renovation right now and I can’t wait to share that soon! The whitewashing turned out beautifully and as soon as I have some extra time, I have a few pieces of furniture that I plan to give a whitewash look to also. The formulas for furniture and brick are different so this will be an experiment! Luckily I have an awesome painter so he did the work for my clients but there are plenty of DIY formula’s out there to try to. This link includes formulas for both: How to Make Whitewash in case you’d like to give it a try. I’d love to hear if you do!